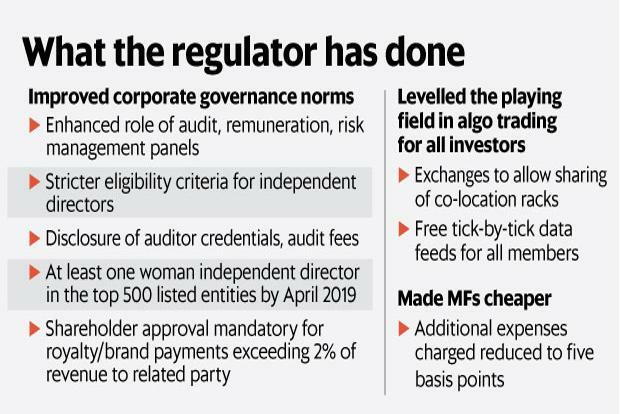 Mumbai: The markets regulator has set new rules aimed at improving corporate governance in publicly traded companies, made algorithmic trading accessible and cut mutual fund fees. The Securities and Exchange Board of India’s (Sebi’s) board approved the norms on Wednesday. The board accepted about half of the 80-odd suggestions made by a panel led by banker Uday Kotak to improve corporate governance, Sebi chairman Ajay Tyagi said. The sweeping changes in governance standards will span areas including composition of boards, the make-up of board committees, treatment of subsidiaries, disclosure for related-party transactions, audit evaluations and conduct of annual general meetings. The board has approved an enhanced role for audit, nomination & remuneration and the risk management panels. It has also accepted a proposal to disclose auditor credentials, audit fees and reasons for auditors’ resignations. The panel’s recommendation on increasing the oversight on auditors will be decided keeping in mind the norms proposed by the corporate affairs ministry for auditors and changes that may occur due to the setting up of National Financial Reporting Authority, the proposed independent regulator for auditors, said Tyagi. The board also accepted the suggestion that firms disclose how they are using funds raised through preferential issues and placement to institutions. Moreover, the board said an individual can serve as a director on the boards of only seven companies by April 2020, down from 10 now. It also mandated that the top 500 listed entities have at least one women director by April 2019. Similarly, the board said that minority shareholder approval was mandatory for royalty/brand payments to related parties exceeding 2% of revenue. The regulator also cut the expenses charged to mutual funds in lieu of exit loads by 15 basis points to 5 basis points. A basis point is one-hundredth of a percentage point. On Wednesday, Mint reported that a Sebi internal study found that mutual fund schemes had levied unfair charges of around Rs1,500 crore owing to these fees.